Here is my Keto version of an old breakfast favorite. Who am I kidding, I ate these a box at a time at 11pm. Melt your mozzarella in a microwave safe bowl in the microwave in small bursts. You don’t want to heat your cheese up too much or too fast. For this amount of cheese I would recommend 20 seconds, stir, back in for another 20 seconds. Remember, you can always pop something back in to warm a bit more but you can’t uncook something. In a separate bowl, combine your Almond flour, sweetener, and baking powder. If you don’t have powdered sweetener I would either grind it up in your blender to powder it, or add it to your mozzarella so that it has some time to dissolve. I would add it after it’s melted and mix well. Roll out the dough between two pieces of parchment. I roll it out until it’s pretty thin, less than a quarter inch thick, into a square or rectangle shape. Prepare your filling by simmering the strawberries and sweetener and water in a small sauce pan. I mash the strawberries against the sides of the saucepan with a wooden spoon as they simmer. You can also start with finely chopped strawberries but I’m lazy! Continue stirring the mixture as it simmers until it has thickened. If you have issues with thickening you can add a tiny sprinkle of Xanthan gum. Be very careful with this ingredient if you haven’t used it before, a little goes a long way and adding too much will make your filling too gummy. Spread the strawberry filling on one side of your square. Take an egg wash and run it around the inside edge of the entire sheet of dough. Fold the empty side over the filled side and press gently to seal the edges. Sometimes I cut the edges straight with a pastry scraper. You do not have to do this! I take this extra step because I’m a perfectionist weirdo and I do think that pressing the edges shut to cut them straight does help seal them. 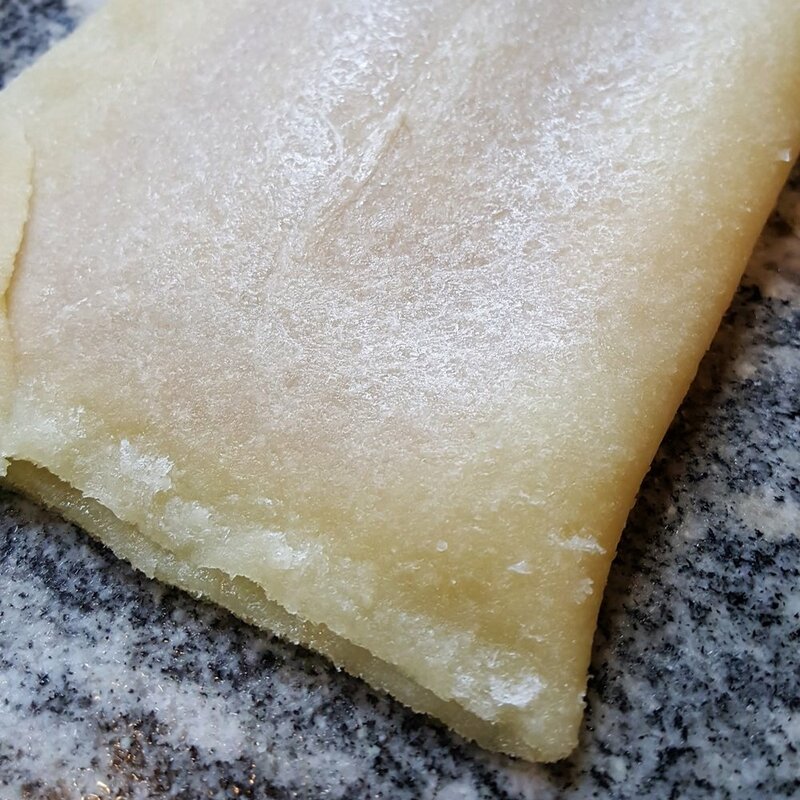 Bake your pastry on a piece of parchment, the one you used to roll the dough out will do just fine, at 350 for 8-10 minutes. Once your pastry is baked and then cooled, drizzle the top with your icing and enjoy! I usually get two servings out of one pastry. Per serving based on 2 servings. Filling and frosting ARE included in this nutrition information. Looking for something else? Enter your search terms above to see more recipes. Click on any image below to see my most recent recipe posts.